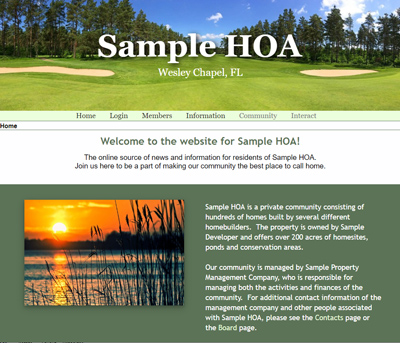 HOASpace.com is the community and HOA website solution of choice for hundreds of homeowners associations across the country. 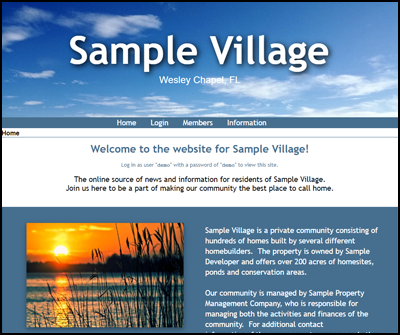 For more than years we've specialized in providing neighborhood web sites that offer the features you want most. Our affordable plans come with no setup fees and no long-term contracts. Compare our plans and pick the one that's right for your community. 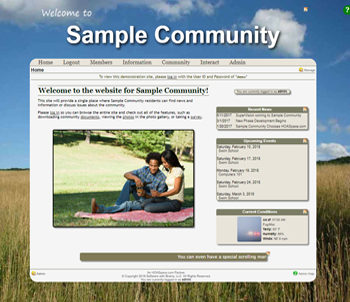 HOASpace offers the most sought-after features for a community web site, all in an easy-to-navigate user interface. Start working on your own custom web site in less than five minutes, and take a month on us to kick the tires! There's no obligation. "The HOAspace software has a diverse array of capabilities that address every imaginable need for improving HOA owner and public communications"
Display recent articles from RSS news feeds. Member photo may be uploaded to profile. Hosted on dedicated server at the SingleHop data center. Server protected by firewall and monitored 24/7/365. 1 Requires a PayPal™ or other third-party processor account to accept credit card or e-check payments. 2 If you have previously registered a domain name, we will park your domain on your HOASpace site at no additional charge. No Setup Fees. No Cancellation Fees. No Contracts. Our Economy Plan includes some of our most popular features* as described on the Plan Comparison page, and is perfect for smaller communities looking for a single place to post documents as well as current news and information. Our Extended Plan includes many of our most popular features* as described on the Plan Comparison page, and is well-suited for larger communities or those that would like to have more interactive features on their web site. Our Mega Plan includes all of our most popular features* as described on the Plan Comparison page, and will meet the needs of larger communities that have many documents or photos to store on their website. †See Terms of Usage for complete details.